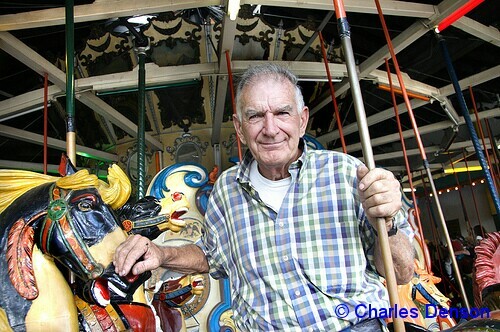 Jimmy McCullough, whose family has operated amusements in Coney Island for four generations, passed away at his home on August 19. Born in 1929, Jimmy McCullough grew up in Long Island and began working in Coney during World War II in one of the 22 shooting galleries then owned by his grandfather, he told historian Charles Denson in an interview for the Coney Island History Project’s Oral History Archive. He recalled working long hours–until 3, 4, or 5 o’clock in the morning at the family’s amusement attractions. 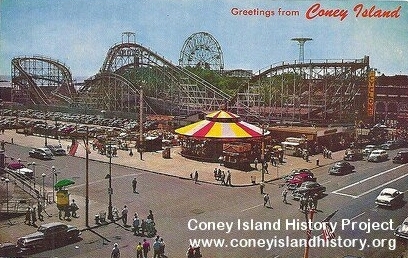 “Coney Island was the center of our world,” said McCullough, whose great-grandfather was George C Tilyou of Steeplechase Park and whose mother was a Stubbman, a family who operated a beer garden, hotel and carousel where the Aquarium is now. Jimmy McCullough was also a traveling showman. 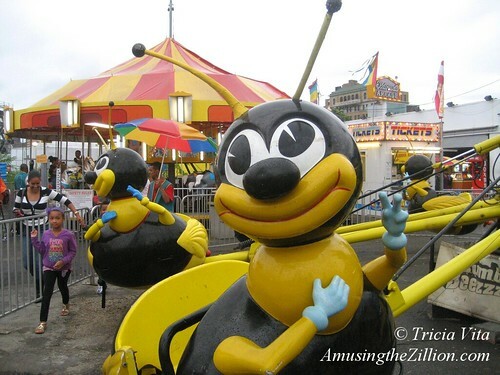 Along with his daughters Carol and Nancy, he owned and operated such rides as one of the first Zippers ever manufactured, the Round-Up and the Skywheel, which they brought to Toronto’s CNE and booked into fairs as independent ride operators. Last September, ATZ wrote about the McCullough family’s history in Coney Island when their 50-year-old kiddie park at the Bowery and 12th Street closed after a lease renewal with Thor Equities fell through. The lot has stood vacant ever since Coney Island’s oldest ride operator tore down his Herschell carousel and kiddie rides and left. In the 1950s, the McCullough family had Kiddielands at Surf Avenue and 15th Street and Surf Avenue and 8th Street next to the Cyclone. They also owned and operated three historic carousels in Coney Island which are now in City parks and are their lasting legacy to the people of New York. The 1912 carousel carved by Charles Carmel, which was at 8th Street, became the Prospect Park Carousel in 1952. The Stubbman Carousel, known as the Steeplechase Carousel when the McCulloughs operated it at 16th Street and the Boardwalk, was sent to the New York World’s Fair in 1964 along with some horses from Feltman’s and still operates in Flushing Meadows Park. The third is the B&B, the last hand-carved wooden carousel in Coney Island, which Jimmy McCullough sold to the City in 2005 after the death of his business partner Mike Salzstein. The restored B&B Carousell opened with much fanfare in Coney Island’s new Steeplechase Plaza this year. Services for Jimmy McCullough will be held at William E. Law Funeral Home, 1 Jerusalem Ave, Massapequa, NY on Thursday, August 22, 7-9PM and Friday, August 23, 2-4:30PM and 7-9PM. The funeral will be on Saturday, August 24, at 10AM at Maria Regina R.C. Church, 3945 Jerusalem Ave, Seaford, NY. Those wishing to make an expression of sympathy in his memory are asked to consider a donation to St. Jude’s Hospital or The Alzheimer’s Foundation. He was such a nice guy- the real fabric of a certain Coney Island time. That’s awesome that you got to paint the bees! The McCulloughs and their rides are much missed by friends and visitors alike. Sad to see a weed filled lot where the park was for decades. Nice job Tricia, on your story and obit on Jimmy McCullough!!!!! I am sort of in shock. It’s Nov 7 2014 and I didn’t know about it till today. I knew Jimmy since i was a little kid and he was running the kiddie park Zipper Round up Sky Diver and an 8 armed Black spider.. This was back when he and George Tilyou were running it.i remember Mike running the carousel. He was there so much i used to think he had a room in the back. RIP Jimmy. Anyone know whats up with Danny? Video: Grand Prize Winner of Luna Park Coney Island's Film Contest!